General: No power source required. 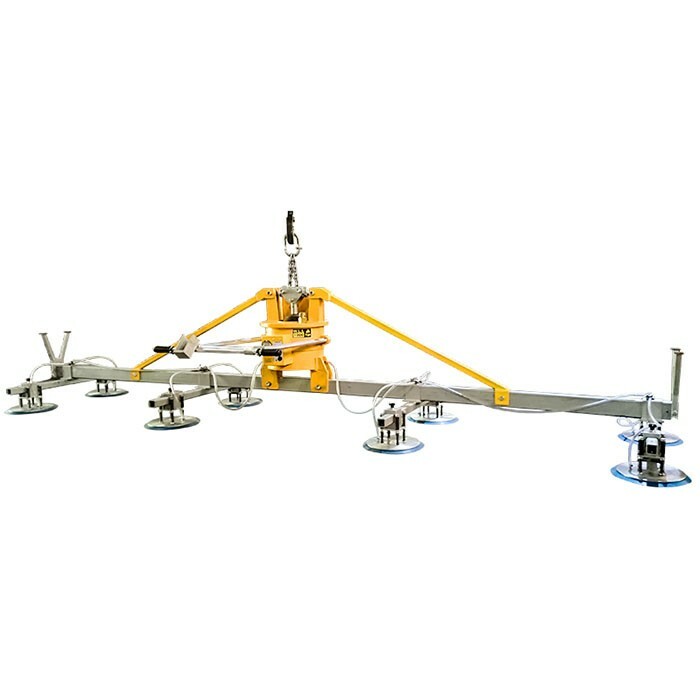 Ideal for the horizontal handling of nonporous sheet and plate material such as, diamond sawn or polished granite polished engineered stone, all types of metals, plastics and fibreglass. It has a telescopic front handle bar and adjustable vacuum pads. Features: - Self-powered and self-cycling. - Simple to operate. - Easy to maintain. - Able to handle a variety of sheet sizes. - Extremely safe. Load cannot be released until it is set down on a surface. - Capable of 100% duty cycle, 24 hour a day operation. - Audio alarm system. Independently powered by a non-rechargeable 9v battery. - Vacuum gauge for visual warning of low vacuum. - Telescopic front handle. Specifications: - Rated capacity: 1000 Kgs (2,204 Lbs) - Number of Pads: 8 - Diameter of pad: Seal to seal 300 mm Battery information for alarm system: * 9V non-rechargeable battery * 6-month warranty Note: For materials with a rough surface texture, such as exfoliated granite, concrete and textured metals, refer to our electric or air powered vacuum lifters with foam rubber pads.